A campaign by a weekly newspaper has been praised in Parliament for bringing down petrol prices in its area. 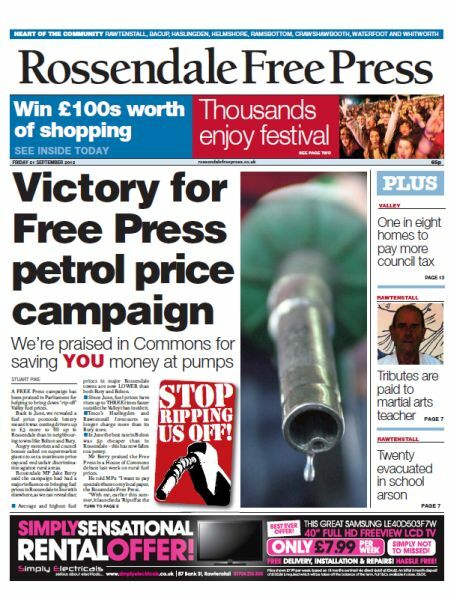 The Rossendale Free Press launched a campaign this summer after discovering that fuel prices were cheaper in neighbouring boroughs. The paper reported that there was a difference of 5p per litre between a local Tesco supermarket and an Asda in Bury, meaning motorists would be paying around £3 more each time they filled up. Following the campaign, fuel prices in Rossendale have been brought in line with neighbouring areas and the campaign was praised in the House of Commons by local MP Jake Berry, who backed the paper’s drive. Mr Berry said: “I want to pay special tribute to my local paper, the Rossendale Free Press. With me, earlier this summer, it launched a ‘Rip off at the pumps’ campaign. “We took the price at our local Tesco and compared it with the price at the Asda in Bury, and, as I said, there was a 5p difference. I personally met representatives of Tesco here in Westminster and asked how they arrived at that price. Editor Gareth Tidman said the paper’s journalists were delighted to have helped ease the burden of fuel prices on their readers. He added: “We thought it was outrageous that people in Rossendale should be paying more than motorists in neighbouring boroughs. It is the latest success for the paper after its ‘Get Us Back on Track’ campaign led to talks about the creation of a rail link between towns in the Valley and Manchester. The paper has also been campaigning for action after the area was hit by major floods three times over the summer and has also launched a bid to save a local swimming pool from closure.